The RS3 just got even more powerful thanks to B&B's three stage tuning program. The 2012 Audi RS3 has been given a big power boost thanks to tuners B&B. The program consists of three stages with each progressively putting out more power. The base Audi RS3 comes fitted with a turbocharged 2.5-liter 5-cylinder engine that puts out 335hp and 332lb-ft of torque. The first stage cranks up the juice to 404hp and 413lb-ft of torque. Stage two of B&B&apos;s program takes the power up to a nice 444hp and 442lb-ft of torque. The biggest jump is saved for the powerful stage three segment which drives up the power of the RS3 to an impressive 510hp and 501lb-ft. The final stage adds a larger turbocharger and a stainless-steel exhaust engineered for high performance. The Audi RS3 has performance to boot with a 0-62mph time of 3.5 seconds and a top speed measured at 193mph. 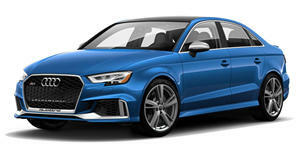 The German tuners also gave the RS3 a two-mode sport suspension, lowered the ride height, put on 19- or 20-inch wheels and added a high-performance brake system to help handle the added performance. Pricing for the third stage Audi RS3 is set at €15,950.